Want to know what it's like when a real gaming fan is in charge of a videogame movie? Read on. 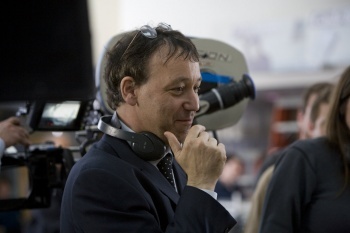 It's been nearly a year since Sam Raimi's involvement with the World of Warcraft movie was announced, and speaking outside the Saturn awards, he let us in on how the project was coming along. "We're still working on the story right now. We've got a 40 page document which needs a lot more work, but every draft that we do with Robert Rodat gets better and better. We're finding the characters, and through the characters we're finding the story." "There's no real angle on it, we're just trying to create realistic character that can live in the world of Warcraft, as though you were in the game itself, in one or two or three of those environments, and see the interaction with those great mythical, iconic characters." Raimi also spoke about his love for the game itself, saying the characters and the environments really appealed to him: "I love the visual world that the guys over at Blizzard have created. It's incredibly, engrossingly, terrifying and exciting. I like the use of scale; the giant monsters they have. I love the different landscapes your character can move through. I like the first person interaction you have with other player online. " "There's so many aspect of the game that I really enjoy. I like doing sword battles, performing spells and learning new spells and getting to the next level like everyone else ... I had a level 29 shaman that somebody deleted by accident, and now I have a new character I've worked all the way up to level 72." Raimi really does seem to love World of Warcraft, which seems like a real mark in the movie's favor. A talented director that understands the source material is a boon to any movie, but in the all-too-often disappointing world of videogame movies, it's positively exciting.